Learn how our scientists made better materials for batteries with metal oxide and graphene, components that assemble on their own into durable nanocomposites. Select to View Video. Last year, researchers at Pacific Northwest National Laboratory and their collaborators at Princeton University published a paper in ACS Nano that has become one of the top cited articles of 2010. To celebrate the articles, the American Chemical Society asked authors to put together a video describing their work. Visit the SciVee TV website and learn how our scientists made better materials for batteries with metal oxide and graphene, components that assemble on their own into durable nanocomposites. Acknowledgments: This is work is supported by the Transformational Materials Science Initiative, funded by the Laboratory-Directed Research and Development Program at Pacific Northwest National Laboratory, and the U.S. Department of Energy Office of Basic Energy Sciences and the Office of Energy Efficiency and Renewable Energy. The article was written by Donghai Wang, Rong Kou, Daiwon Choi, Zhenguo Yang, Zimin Nie, Juan Li, Laxmikant V. Saraf, Dehong Hu, Jiguang Zhang, Gordon L. Graff, and Jun Liu, and Princeton scientists Michael A. Pope and Ilhan A. Aksay. The transmission and scanning electron microscopy work was done in EMSL, a national scientific user facility at PNNL. Reference: Wang D, R Kou, D Choi, Z Yang, Z Nie, J Li, LV Saraf, D Hu, J Zhang, GL Graff, J Liu, MA Pope and IA Aksay. 2010. 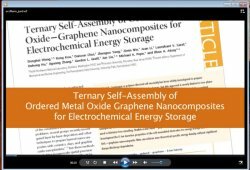 "Ternary Self-Assembly of Ordered Metal Oxide-Graphene Nanocomposites for Electrochemical Energy Storage." ACS Nano 4(3), 1587-1595.